Amongst all the Norwegian towns and cities on my “to-do” list, Molde is nowhere to be found. So just how did I end up spending a weekend there? Some unexpected income led to an invite from Dave to join me for the Molde-Vålerenga match, but Trondheim to Molde is not the simplest journey. Exploring Norway is easy from Oslo. Several major train lines spray out in all directions, and you can reach all corners of the country directly from Gardermoen Airport, with SAS, Norwegian, or Widerøe. From Trondheim, things get a bit trickier. Planes are expensive to get anywhere beyond the big cities, and the train lines out of the town are all painfully slow. To get down the west coast to Molde, I had two choices – an expensive and inconvenient flight with an airline I'd never heard of, or take my first long-distance bus ride. I found tickets on Nettbuss for NOK 249 each-way, a bargain in Norway, and a room at the Rica Seilet Hotel, so I accepted the invitation and was on my way to my third Vålerenga away match. Taking intercity buses is commonplace in Norway, particularly on the west coast where it's expensive to fly and expensive to drive, due to the tolls on many bridges, tunnels, and ferries. The network is impressive even though the buses don't run very often. The 155 might be advertised as Trondheim to Ålesund, but it also runs through Molde and connects with other buses serving Kristiansand and a whole range of other towns and villages. The buses are modern, comfortable, offer free wifi, and stop every couple of hours to allow a comfort and/or coffee break, often where the bus routes connect. Having said that, five hours on a bus is heavy-going and I'd only recommend it if it's the only option, not just because it's the cheapest. One amusing aspect to the journey was some of the bus stops – they appeared to be almost personal bus stops for some houses in the middle of nowhere! My first impression of Molde was simple – it's a tiny town. The town centre is basically one street, one small shopping centre, a town hall and a church. Just fifteen minutes walk from the bus station, during which you see the entire town centre, is the impressive Aker Stadion, conveniently located right next to our hotel. 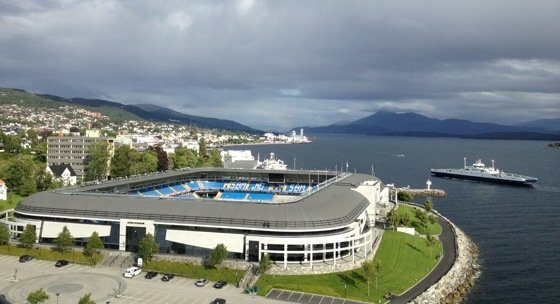 But despite the local pride, there really isn't much to see in Molde, especially as a tourist. All but one of the attractions listed on the homepage of the Visit Molde website are out of the town, the only exception being a week-long jazz festival, which was held back in July! It is a pretty setting though, offering a great view across the fjord, especially from the balcony of our hotel! You can allegedly see 222 peaks from Molde. 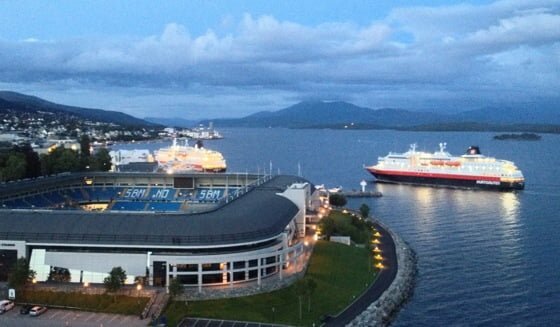 We didn't verify this but did spend a huge amount of time on the balcony admiring the view, particularly when not one but two Hurtigruten ships docked in town on Saturday night.